SwordSearcher benefits you by giving you the tools to search, study, and read the Bible quickly. 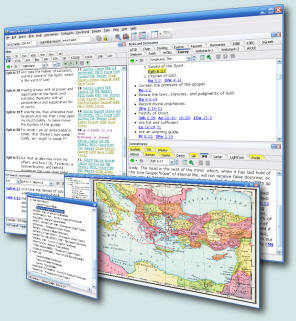 It includes several commentaries, dictionaries, topical guides, maps, charts, and illustrations; it is far more than just a computer Bible concordance. It offers unique and powerful study features that are easily accessed and used with an intuitive interface, ideal for both devotional and in-depth study. Bible search instantly: You will find Bible verses instantaneously, immediately seeing every verse you are looking for with any given word, group of words, or phrase. Instantly find all relevant study material by verse reference: You will research references on a Bible verse or passage quickly, because SwordSearcher's library is indexed by Bible verse. All you do is tell SwordSearcher's Verse Guide the verse or passage you need indexed, and instantly you will have every entry in each book, topical guide, dictionary, or commentary that references that verse. Know what is available at a glance: You will see at a glance the available reference material for each verse, because SwordSearcher displays links to relevant reference material next to each verse. Easily share Bible verses in email or other documents: You will improve your productivity by allowing SwordSearcher to copy Bible verses into your documents for you. Whether you are writing a letter in Word or composing an email, inserting the text of a verse is just a few key presses away.